The following overview of fall shorebird migration prepared and presented by Kenn Kaufman, Kaufman Field Guides. The shorebirds - sandpipers, plovers, and related birds - are very popular with birders. More than 40 species have been found in Ohio, and more than 30 of those are found in good numbers every year. Only about five can be found nesting in the state, and only Killdeer and Wilson's Snipe regularly stay through the winter. All the rest are migratory, passing through in spring and/or fall. For many of us, the southbound migration of shorebirds is among the highlights of the year, and one that we can enjoy for months. We call it the "fall" migration but it is in full swing by the first of July, and a few shorebirds are still passing through at the beginning of December, so it's a phenomenon that lasts for well over one-third of the year. Shorebird identification can be a challenge. It helps to distinguish between adults and juveniles of most species, and it helps to know which species to expect at different times during the season. I've put together some information on the expected timing in northern Ohio; much of this will be applicable in surrounding regions as well. The info is presented here in two forms: as an outline of what to expect as the season progresses, and as details for each species. If you take note of this information, or print it out, you can go out better prepared to recognize the shorebirds you see. Most of our migratory shorebirds nest in the Arctic, where the breeding season is quite short, which helps to explain their early southward movement. Some may head south in June if their first attempt at nesting fails, because there may not be time, in the brief Arctic summer, for a second attempt. In a number of species, one member of the pair will leave before the young are full-grown (or even before the eggs hatch), leaving the other parent to finish raising them. 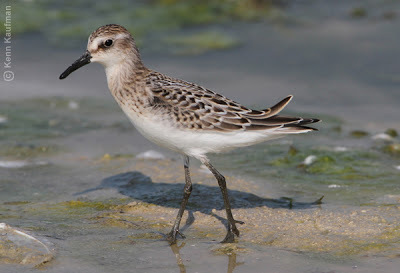 For all of these reasons, adult shorebirds of many species begin to show up in Ohio by the end of June, and the fall migration is in full swing before the Fourth of July. 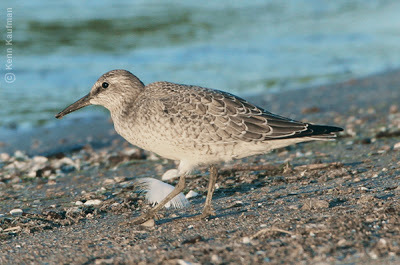 Juveniles of most shorebird species migrate later than adults. There is often a full month between the peak passage of adults and the peak passage of juveniles. 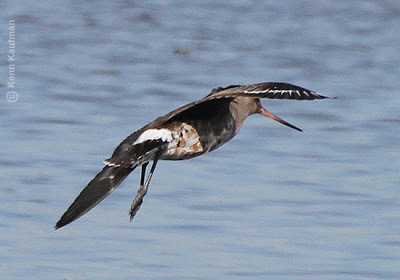 Adult Hudsonian Godwit showing the remains of breeding plumage. In Ohio, adults are most likely to occur in late August, at least four weeks before the peak passage of juveniles. Of course, a few individuals occur outside the main dates listed here. Some shorebirds present in Ohio on random dates in midsummer may be one-year-old birds that did not go all the way to the breeding grounds. Early July: By the end of June or the first of July, a few southbound shorebirds are showing up already. The first to arrive are all adults. 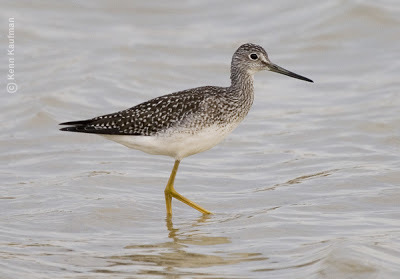 Least Sandpiper, Greater and Lesser Yellowlegs, and Short-billed Dowitcher are often among the first species to arrive. The peak southbound migration of adult Short-billed Dowitchers actually occurs in mid July, and they are often most common in flooded fields after heavy summer rains. 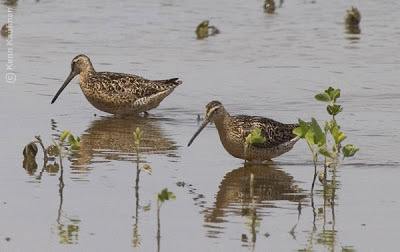 Adult Short-billed Dowitchers (of the prairie subspecies, hendersoni) in a flooded soybean field in mid-July. Late July: The variety of shorebird species picks up considerably in the second half of the month. Most of those arriving are still adults, but the first few juveniles (of Least Sandpiper, for example) will show up late in the month. August: This is my favorite month for shorebirding. Most other groups of birds aren't migrating in an obvious way until near the end of the month, but the shorebird passage is in full swing. It's the best month for seeing a mix of juveniles in very fresh plumage and adults in the remains of breeding plumage, for great studies of ID. September: Numbers and diversity of shorebirds are high throughout the month. They still include a mix of adults and juveniles, but the juveniles may not look as fresh (the brightness of this plumage fades quickly) and the adults may look more worn. 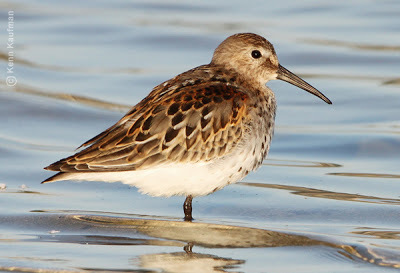 For some species, such as Semipalmated Sandpiper and Short-billed Dowitcher, the adults are mostly gone by now and most of those present are juveniles. On the other hand, some species such as Dunlin and White-rumped Sandpiper are still represented mostly by adults, with the juveniles coming later. October: Variety and numbers continue to be good, especially during the first half of the month. 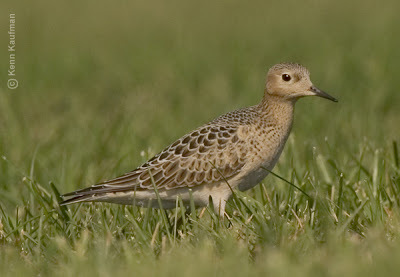 Juveniles of some long-distance migrants, such as American Golden-Plover and Hudsonian Godwit, are most likely to be seen during this time. Numbers of Dunlins increase throughout the month. Along Lake Erie, the largest numbers of juvenile Sanderlings may occur in October. November: Quite a few species linger into early November, but variety and numbers drop after about the first week. A few species are seen in numbers through most of the month, including Greater Yellowlegs, Pectoral Sandpiper, Dunlin, and Wilson's Snipe. Also present in smaller numbers are American Golden-Plover, Lesser Yellowlegs, Least Sandpiper, Sanderling, and Long-billed Dowitcher. This is also the time to look for certain rarities such as Purple Sandpiper and Red Phalarope. Black-bellied Plover: Found mainly from late July to late October, although a few may be found from early July to early December. Mostly adults at first, with juveniles appearing mainly from September on. American Golden-Plover: Found in fair numbers from early July through November. Those seen before the end of August are mostly adults, with juveniles beginning to arrive in late August and early September. Peak passage is usually during October, mostly juveniles. Semipalmated Plover: Adults appear in good numbers by mid to late July, with juveniles appearing from mid-August into September. The species remains common into early October and fairly common through the end of that month, with a few straggling into November. 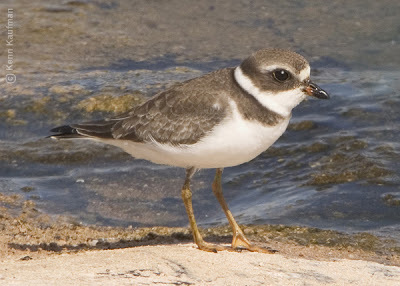 Juvenile Semipalmated Plover. The pale scalloped markings that distinguish the juvenile from the adult are difficult to see from a distance. Photographed in early September. Piping Plover: Rare migrant, any time from July to November. Killdeer: Abundant through early November, with stragglers into December. American Avocet: Rare in fall, any time from July through October. Spotted Sandpiper: Breeds locally, so present all summer. Most numerous from late July through early September, as local breeders are joined by migrants from the north. Still fairly common through October, with a few into November. Solitary Sandpiper: The first adults appear in early July, while juveniles peak in mid to late August. The species is most numerous during August, with fair numbers through September and fewer through late October. Greater Yellowlegs: Adults begin to show up in late June or early July, and they peak in numbers during August. Juveniles start to appear by about the first of August, and their peak numbers occur in late September. The species as a whole is fairly common through October, with smaller numbers through the end of November. Juvenile Greater Yellowlegs in late October. The pattern of white spots along the edges of the tertials and coverts, separating the juvenile from the adult, is becoming less obvious by this late in the season. Lesser Yellowlegs: The first adults appear by the beginning of July, with peak numbers from mid July through early August. The first juveniles arrive at the end of July or early August, with peak numbers in late August and early September. The species as a whole is fairly common through early October, with a few lingering through November. Although the timing overlaps broadly with that of Greater Yellowlegs, the Lesser tends to peak earlier in the season. Willet: A scarce fall migrant, appearing any time from July through October. Willets that pass through Ohio are from of the western subspecies, and in fall they are migrating eastward toward the Atlantic Coast. Upland Sandpiper: Now practically gone as a breeder, and only a scarce migrant. Formerly occurred in flocks in mowed fields in late July and early August, and small numbers still pass through at that time; unlikely to be seen after the first week of September. Whimbrel: A scarce fall migrant that might be seen any time from July through early October. 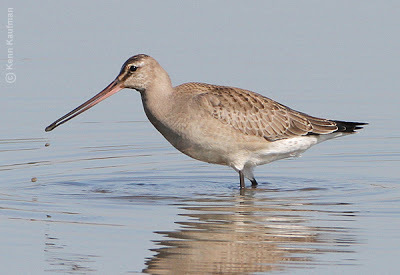 Hudsonian Godwit: A handful of adults may appear any time from the end of July through November, with a minor peak in late August. Juveniles begin to show up at the end of August. They may occur in larger numbers, sometimes into the double digits or even the low dozens, mainly from mid-September to mid-October. Juvenile Hudsonian Godwit in early October. Usually a rare migrant here. When habitat conditions are right, dozens may stop over in the Lake Erie Marsh region of n.w. Ohio, especially at Ottawa National Wildlife Refuge. Marbled Godwit: A scarce fall migrant with a handful of individuals seen in most years, any time between July and late October. Ruddy Turnstone: Less common in fall than in spring, but may be seen (most commonly along Lake Erie) from mid-July to mid-October, with a few into November. The first juveniles usually arrive in mid to late August, with peak numbers in September and early October. Red Knot: A rare fall migrant, mainly along Lake Erie. Adults may appear by mid to late July, with the first juveniles arriving in mid to late August; they might be seen any time through October or even into November. Juvenile Red Knot in late August on the Lake Erie shoreline. The neatly scalloped pattern of the upperparts was illustrated in some older books as "winter plumage," but in fact it is characteristic of juveniles; adults in winter plumage are a much plainer gray above. Sanderling: Seen mainly along the immediate shoreline of Lake Erie, much more uncommon inland. Lingering birds are sometimes seen on random dates in summer, but southbound adults begin to appear by mid-July. The first juveniles show up by mid to late August, but their peak numbers don't occur until late September and October. A few Sanderlings may be seen through the end of November. Semipalmated Sandpiper: A common fall migrant, with adults appearing by the beginning of July and building to large numbers by mid to late July. Juveniles begin to arrive around the first of August, and build to large numbers by early September. The species remains common through September, but only rare stragglers are seen after the middle of October. Juvenile Semipalmated Sandpiper in late August. The bright, crisp patterns of juvenile shorebirds are beautiful at close range, and they provide another incentive for us to observe this group of birds. Western Sandpiper: An uncommon migrant, passing through in very small numbers. Adults may appear by the beginning of July, with the first juveniles arriving in early August. 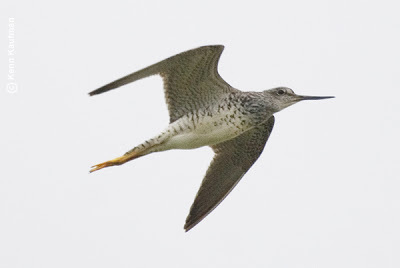 Most sightings are from mid-August to mid-September, but a few may be seen through October and into November, after essentially all the Semipalmated Sandpipers have departed. Least Sandpiper: A very common fall migrant. The first southbound adults usually appear in late June, and they are common by mid-July. The first juveniles arrive in the latter part of July. The species is very common from late July through September, with good opportunities to compare the plumages of adults and juveniles. It remains fairly common through October, and small numbers may be seen through November. White-rumped Sandpiper: A regular migrant in small numbers. The spring migration is notably late, with some still passing through in mid-June. A few adults are seen in July, with more showing up in August. Juveniles may not appear until sometime in September, and their peak numbers are usually in October, with a few lingering into November. Baird's Sandpiper: A regular migrant in small numbers. Few adults occur in the state, although a handful have been found in late July and August. Juveniles begin to arrive in August, and are seen mainly from mid-August to mid-September, although some are found through October and stragglers have been seen as late as December. Pectoral Sandpiper: A common migrant, seen in numbers from early July to early November. The earliest migrants are adults, and juveniles begin to show up by mid-August; but juvenile and adult Pectorals are hard to distinguish at a distance, so many fall birds aren't aged in the field. Substantial numbers may still be present in November, with stragglers into December. Purple Sandpiper: A rare migrant, found mostly on rocks along the edge of Lake Erie, late in the fall. Some have been found as early as October, but most are seen in November or December. Dunlin: A common migrant with a long season of occurrence, but peaking relatively late in the fall. A handful of adults may be seen at any time during the summer, possibly birds that did not go all the way to the Arctic breeding grounds, and small numbers are seen regularly through August. Numbers do not pick up appreciably until the end of September, and they are most common from early October through mid-November. A few linger into the winter, and the species has overwintered in the state. Juveniles are rarely seen before the very end of September. Juvenile Dunlin in early October. These birds begin to molt out of juvenile plumage before they leave the Arctic; on this individual, a couple of the brightly patterned scapulars already have been replaced by plain gray feathers. 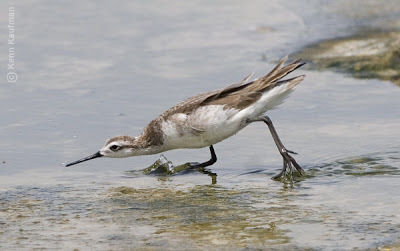 Stilt Sandpiper: A regular migrant, most common in northwestern Ohio and usually seen in small numbers farther east and south. Adults appear by early July and are most common from late July through August. The first juveniles arrive by early August, with peak numbers from mid-August through September. Fair numbers are seen regularly through October. Buff-breasted Sandpiper: A regular migrant in very small numbers, occurring in extensive short-grass areas near Lake Erie and at the edges of flooded areas inland. A very few adults may appear from late July through August, but most individuals in Ohio are juveniles, found between late August and early October. Juvenile Buff-breasted Sandpiper in early September. This species really should be considered a "grasspiper," and it is often found in expanses of short grass or in dry fields, away from typical shorebird habitat. Short-billed Dowitcher: Adults arrive by the end of June or early July, and become very common by mid to late July. Juveniles first appear around the first of August, with peak numbers from mid-August to early September. Small numbers are seen through late September and into early October, but dowitchers seen after mid-October are more likely to be Long-billed. Juvenile Short-billed Dowitcher at the end of August. In fresh plumage, these juveniles may seem as brightly colored as spring adults, but a glance at the calendar and a study of the crisp, fresh feather edgings on the upperparts will make it obvious that these are young birds. 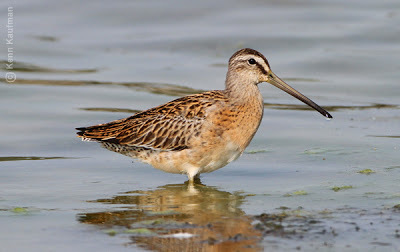 Long-billed Dowitcher: Much less common than the preceding species, and generally occurs later in fall. More likely to be seen in northwest Ohio than elsewhere in the state. A few adults may appear in July, but they become most numerous in mid to late August. The first juveniles usually arrive in late August or early September, with peak numbers from mid-September to mid-October. Small numbers are found regularly through mid-November, with stragglers into early December. Wilson's Snipe: A few snipes stay through the summer in northern Ohio, and small numbers spend the winter, especially in the southern counties. In between, the species is a common migrant. A few begin to show up at new spots by mid-July, and migrants are fairly common from early August through November, with peak numbers in October. Wilson's Phalarope: A very rare breeder in Ohio and a very uncommon migrant. Fall migration begins very early, with adult females on the move by mid-June and adult males by early July. Juveniles may be seen as early as mid-July. Small numbers are found in Ohio wetlands as late as October or even early November, but peak numbers usually occur in August. Male Wilson's Phalarope. Among phalaropes the females are the more brightly colored ones, and many adult males look quite drab. Red-necked Phalarope: A very uncommon migrant, with the first adults appearing as early as late July and the peak passage in late August. Juveniles occur in small numbers from late August to mid-October, occasionally later. Red Phalarope: A rare migrant, found mostly along Lake Erie, very rarely on inland impoundments. There are scattered records of adults as early as August, and stragglers have been found into January, but most likely to be seen in October or November, especially mid-November. Black Swamp Bird Observatory has been doing shorebird surveys in n.w. Ohio for years. Several years' worth of annual reports on these surveys can be found HERE by scrolling down to "Shorebird migration studies." It's also possible to see some overall patterns by going to the eBird database. From the eBird home page, select "Explore Data" and then follow the instructions for creating a bar chart of timing for the state of Ohio, or for specific counties or sites of interest. Thanks to Mark Shieldcastle for suggestions that improved this summary, and thanks to all the birders who have collected data on shorebird migration over the years.